Since my working week starts on Tuesday this week thanks to Presidents' Day, I thought I'd check why. My first discovery was that, rather than celebrating every US president (luckily, since there have clearly been a few duds in recent decades), the day actually celebrates Abraham Lincoln and George Washington who both had birthdays in February. I couldn't help wondering whether tall US Presidents, like us lesser (but taller!) folk, had to contend with the problems of finding clothes tall enough. After all, their average height has been 5'11" (180cm) and the present incumbent is 6'1". So for those wanting to feel presidential, here's some tall clothing tips from two of the tallest. Barack Obama, at 6'1" tall, has been widely described as a 'style icon' and has maintained a sharp style right into the White House, resisting the temptation to dress down to seem more like just a regular guy (cowboy boots, anyone?). Still, while he is reported to have started his presidential campaign wearing expensive Italian suits from Ermenegildo Zegna, he has since opted for classic American style from a less exclusive source. He is reported to favor Hart Schaffner Marx, a Chicago based store under the same ownership as upmarket Hickey Freeman. At Hart Schaffner Marx you can get a nice extra long wool suit for around $600 - not cheap, but very reasonable compared to the $1500 that Zegna would charge. Coupled with the suit, a crisp white shirt and a smart tie complete the look - perhaps with rolled up sleeves as a slight concession to "smart casual". Those are not hard to find - extra long ties for tall men are available at many sites including ties.com but always go for silk. Shirts with extra long sleeves are also not hard to find - I am biased towards traditional British style such as Savile Row Co, Charles Tyrwhitt or TM Lewin. For a truly crisp look, buy pure cotton in a two-ply fabric with a high thread count (100's or higher). Style tips from Abraham Lincoln (born 1809, died 1865) are probably not so useful these days, despite being an undeniably tall men, at a height of 6'4". He was also a smart dresser, with formal photographs showing him in a suit and waistcoat with a bow tie, doubtless de rigeur for his day. The one clothing fact that stands out was his choice of Brooks Brothers as a favorite outfitter. Although Brooks Brothers prides itself on "its relative unchangeability", the frock coat was part of the outfit that Lincoln was wearing on the fateful night he was shot was custom made for him and I doubt that particular style is still available. 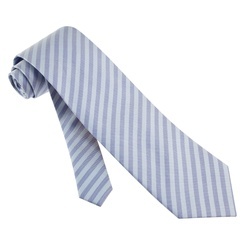 In all other aspects, Brooks Brothers is a go-to place for those in search of classic 'preppy' American styling. More encouragingly, it is present in many outlet malls. However, I always check their selection when I am in an outlet but never find extra long inseam pants and I find the shirts rather baggy. Still, if you're after a bow-tie, an extra long silk tie, some quality accessories or just some high-end inspiration, this is an institution worth checking out. Whether or not you want to emulate the style of some tall presidents, I hope you will enjoy the day of vacation in their honor!